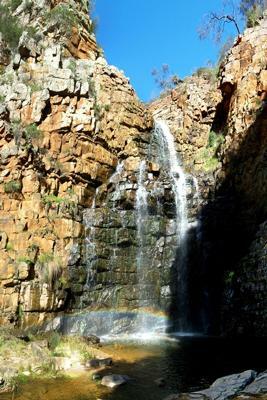 The walk from the car park to the base of the falls takes around 15 to 20 minutes, has a slight gradient all the way, and is very enjoyable in all seasons. There is a boardwalk and platform at the falls. It is also wheelchair accessible and the paths are smooth all the way with several bridges crossing the creek, which meanders down through the conservation park and into the suburbs. It also has stairs leading up to an ‘amphitheatre’ type cave.